Accessible on-street parking not only benefits the people who use it, but also the schools, businesses and facilities served by the parking. Adjacent traffic, curbs, sidewalks, street furniture and space constraints are all contributing factors in the challenge of designing appropriate accessible on-street parking. These accessible parking requirements provide minimum province-wide standards that will meet the needs of a diverse and growing population of accessible parking permit holders. Organizations may need to exceed these minimum standards to appropriately address local needs. The requirements of this section do not apply to private or non-profit organizations. The section only applies to designated public sector organizations as defined in section 80.39 of the Standard. 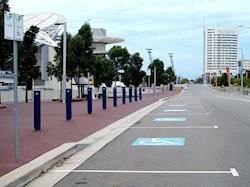 On-street parking can be located on a public highway, street, avenue, parkway, bridge, or similar type of road. The requirements of this Section apply to on-street parking spaces intended for public use, newly constructed or redeveloped by public sector organizations described in section 80.39 of the Standard. Section 80.39 uses a different definition of “designated public sector organization” than the rest of the Standard. It outlines that the requirements for on-street accessible parking apply to every municipality, and to every person or organization described in Schedule 1 to the Integrated Accessibility Standards Regulation, but not people or organizations listed in Column 1 of Table 1 to Ontario Regulation 146/10 (Public Bodies and Commission Public Bodies — Definitions) made under the Public Service of Ontario Act, 2006. 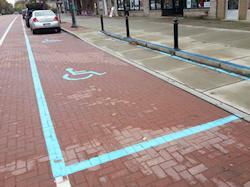 The Standard does not provide specific criteria for the design and placement of accessible on-street parking. Instead, it requires obligated organizations to consult with the public and people with disabilities on the need, location and design of accessible on-street parking spaces. Municipalities must also consult with their accessibility advisory committee if they have one. Refer to Section 1.9 for more information and resources to consult with the public and with people with disabilities. 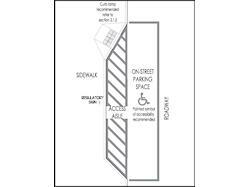 Consider providing access aisles at least 1500 mm wide next to accessible on-street accessible parking spaces to facilitate safe transfers for people who use mobility aids. Wider access aisles will better accommodate vans with mechanical lifts. Also consider that the person using the mobility aid may be the driver. Consider a curb ramp to allow people who use mobility aids to safely move from the road to the adjacent sidewalk. Locate curb ramps so that people who use mobility aids do not have to travel along a vehicle roadway from the parked vehicle to the curb ramp. Consider pavement markings to clearly define vehicle parking spaces and any adjacent access aisles. Pavement sign: Consider including a pavement sign with the International Symbol of Access which enhances the visibility of accessible parking spaces and discourages inappropriate use. Consider pavement signs at least 1,000 mm long and with high tonal contrast to the surface of the parking space. Pavement markings should be slip-resistant.